Our spacious air-conditioned rooms feature all the modern comforts you need to enjoy a relaxed beachside stay. The Executive Ocean View Room is unique with a varying colour palette and soft furnishings in each of our rooms. With stunning glimpses of the ocean through the iconic Norfolk Pines, the room is air-conditioned with floor-to-ceiling glass doors opening onto a private balcony. Featuring a 32-inch flat-screen TV, a refrigerator and tea/coffee making facilities, queen bed, private bathroom and guest toiletries. 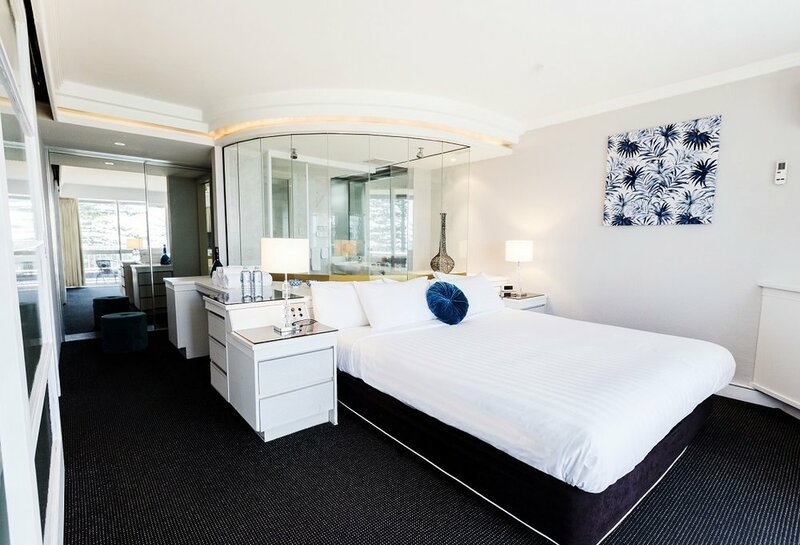 This spacious air-conditioned room features neutral tones with a touch of colour, modern décor and a private balcony offering sweeping Tweed river views. Featuring a 32-inch LCD TV, a small refrigerator and tea/coffee making facilities, queen bed, plush sofa, private bathroom and guest toiletries. The newly decorated room located on level 3 features floor-to-ceiling glass doors opening onto a private balcony. Guests can enjoy modern comforts including a 32-inch LCD TV, refrigerator, tea/ coffee making facilities, air-conditioning, 2 single and 1 queen bed, private bathroom and guest toiletries. With floor-to-ceiling glass doors opening onto a private balcony, this air-conditioned room enjoys glimpses of the Tweed river or a nice leafy outlook. Featuring a 32-inch flat-screen TV, a refrigerator and tea/coffee making facilities, 2 single and 1 queen bed, private bathroom and guest toiletries. This spacious air-conditioned room features neutral tones with a touch of colour, modern décor and a private balcony offering calming river views or glimpses of the ocean. Featuring a 32-inch LCD TV, a refrigerator and tea/coffee making facilities, 2 single beds, private bathroom and guest toiletries. Styled with contemporary colours, this spacious air-conditioned room offers views over the iconic Greenmount Norfolk Pines or the calming Tweed River. The room features a 32-inch flat-screen TV, a sofa, a refrigerator and tea/coffee making facilities, queen bed, private bathroom and guest toiletries. Our air-conditioned split level room features floor-to-ceiling glass doors opening onto a private courtyard. Featuring a 32-inch flat-screen TV, a refrigerator and tea/coffee making facilities, 1 queen bed and 2 single beds, private bathroom and guest toiletries. With stunning glimpses of the ocean through the iconic Norfolk Pines, this air-conditioned room features floor-to-ceiling glass doors opening onto a private balcony, lounge room and kitchenette. The room features two 32-inch flat-screen TV, a pull-out sofa bed and king bed, a refrigerator, private bathroom and spa bath with bespoke guest toiletries. Q: Why should I book using this website? A: By booking using this website you are dealing directly with Greenmount Beach hotel. A: Standard check-in time is 2.00pm. A: Reception opening hours are from 6:30am to 10:30pm. Yes, please give us a call if you're wanting to arrive after 11.30pm. A: No, but we do have secure onsite parking available. Please note parking is limited and subject to availability. A: Yes, all rooms are non-smoking. A: We serve breakfast only but we are in walking distance to a great select of restaurants and cafes. Q: How much is the breakfast buffet? A: Breakfast is $20.00pp for adults. Seniors and children between 5-12 years is $15.00pp and children under 5 years is free of charge. A: 2 minutes by car to The Strand Shopping Centre, 5 minutes by car to Tweed Mall and 9 minutes by car to Tweed City. A: We are a 5 minute walk to a great selection of restaurants and fast food. Need more assistance? Call us on (07) 5536 1222 or email reservations@greenmounthotel.com.au. For full booking terms and conditions, please click here.